Here in southern Appalachia a profusion of plants have been blooming for a bit or are starting to bloom including Bluets (Houstonia sp. ), Daffodil (Narcissus spp. ), Forsythia spp., Dandelion (Taraxacum officinale), Periwinkle (Vinca sp.) Toothwort-Cresses (Dentaria/ Cardamine spp. ), Camellia spp., Chinese Magnolia Magnolia ×soulangiana [denudata × liliifolia], Grape Hyacinth (Muscari sp.) other Hyacinths (Hyacintha spp.) Ornamental Cherries (Prunus spp. ), Flowering Quince (Chaenomeles speciosa), Bridal Veil Spiraea (Spiraea prunifolia), Euphorb (Euphorbia sp.) Poor Person’s pepper (Lepidium sp.) 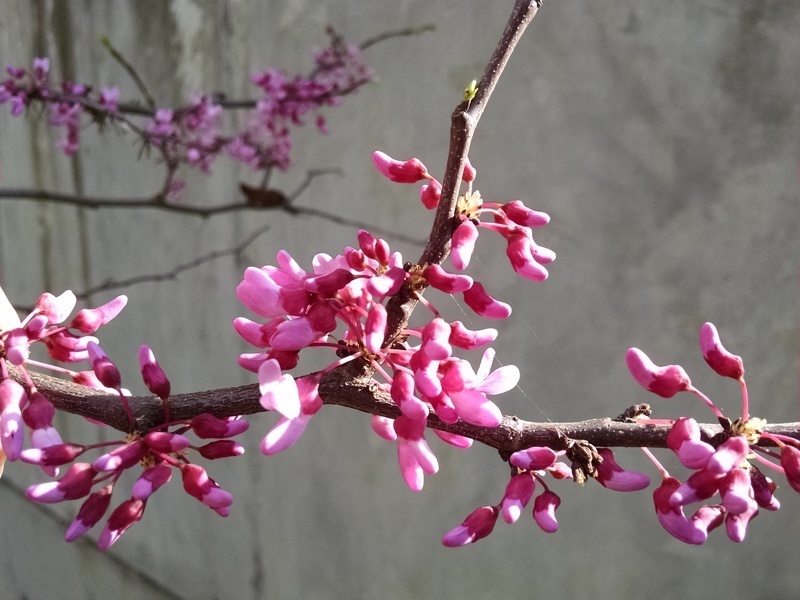 and one of my favorite edible flower Red Bud (Cercis canadensis) featured in the photo here. What plants have you noticed recently? It is gearing up to be an incredibly busy time here around Asheville, NC as i imagine for many of a community… i have two classes coming up at the North Carolina Arboretum next weekend. One is on tree identification and the other is on wildflowers. Yesterday i lectured on Medicinal plants of North Carolina at NC State for the ethnobotany class of my friend and colleague Dr. Jillian De Gezelle. This weekend is our annual in person meeting for the non-profit i help direct Plants and Healers International. Moving forward with the online botanical education! First, we need to work on having some common language and frameworks upon which to file away all the information to come. Make sure to get real familiar with the two inside covers and the first few pages if you have not already. You can also make your own flash card sets with the pictures/terms. The following website has a bunch of premade ones to help you www.quizlet.com/subject/botany. The inside of the front page details flower form and is the same between the 5th edition and 6th edition. Most plant families were traditionally based on the similarity between the flowers. The female parts when present are in the middle of the flower and the male parts, when present, surround the female parts. The petals follow next which are then surrounded by the sepals. Petals tend to be colorful and sepals green. However, when sepals and petals are essentially the same they are called tepals. This often happens in Lily like plants. Most plants tend to have bisexual flowers with both female and male parts. This state is labeled officially in botanical terminology as perfect. It is worth paying attention to the plants that either are monoecious with male and female flowers separate but on the same plant or dioecious with separate male and female plants. Dioecious plants will always need both males and females around to make fruit. Hollies (Ilex spp.) are a good example of this. Monoecious plant families include ones that make nuts such as the Fagaceae (Oak, Beech, Chestnut) Juglandaceae (Hickory and Walnut) Betulaceae (Hazelnut and non nut makers like Alder and Birch). On page one Thomas lays how his book works for us. First you need to start with a little history. Pages two, three and four in the 6th edition state further information from the last class about how plants are ordered at different hierarchical levels. Next, Thomas takes on seven of the most major flowering plant families of the world. Just these seven contain almost 20% of all flowering plants known on the planet! Branching out to other families is easier once you are familiar with these major seven. Two methods for identification include using the keys on pages 25-36 in the 5th ed and 23-35 in the 6th ed or looking up scientific/common names in the index and following them to the family page. Start to pay attention to the plants in your immediate vicinity first. Notice the details that make them different including the flowers, fruits, leaves etc. Attention to detail will automatically illuminate plants more clearly even without knowing who they are or the terminology to classify what you see. Plants that have been present but unnoticed will all of a sudden be surrounding you wherever you go. i agree with Thomas that books organized by family are easier than ones organized by color once you pick up on patterns of plant growth and development. i can know what family most plants belong to almost anywhere in the temperate world now if they have flowers or fruits present especially. If plants are grouped by family it is not hard to quickly find what members are around from the guide and start drawing new connections. My favorite wildflower guide for southern Appalachia is arranged this way and an updated second edition is available (Horn, Duhl, Hemmerly, Cathcart, & Tennessee Native Plant Society, 2013). The company that publishes it, Lone Pine, makes guides for many other areas as well. The one for the northwestern U.S. is another favorite (Pojar & MacKinnon, 2004). You are encouraged to determine how many species occur for each genus in your state or region. A state flora (total listing of plants) or the USDA http://plants.usda.gov can help in this regard. The Carolinas share a flora (Radford, Ahles, & Bell, 1968). However, i often find more useful the flora for the Blue Ridge section of the southern Appalachian Mountains (Wofford, 1989). Dr. Alan Weakley has put together a whole flora of the southeastern U.S. that is free to download and is also updated periodically http://www.herbarium.unc.edu/flora.htm. Many others states and regions have older ones like the Carolinas one mentioned above such as Alaska (Hulten, 1968), Arizona (Kearney, 1964), Hawaii, (Wagner, Herbst, & Sohmer, 1999), Northeast (Gleason & Cronquist, 1991; Holmgren, Holmgren, & Gleason, 1998), Rockies (Weber, 1991),West Virginia (Strausbaugh & Core, 1978). Of course there are great field guides and floras to specific parts of individual states as well. Let me know if you are aware of any modern floras not listed above already. A number of states have excellent online resources including Alabama, California, Florida, New England, New York, Tennessee. Another good computer resource for furthering awareness of plant distribution and diversity is the Biota of North America Program (BONAP) www.bonap.org. The TROPICOS database includes all of the nomenclatural, bibliographic, and specimen data accumulated in the Missouri Botanical Gardens electronic databases during the past 25 years www.tropicos.org. This system has over 1.2 million scientific names and 4.0 million specimen records and tons of pictures. i will offer up a plethora of other electronic resources as well that you may want to have at your command in the next class. What resources are you familiar with that you can add to the list above in your comments below through email or our Facebook group? Thomas includes a description of plant classification schemes that is helpful to wrap your mind around. Carl Linnaeus made a giant leap forward in the 1700s by ordering different forms of life into the now classic binomial system of genus and species. The main focus of Botany in a Day is the family which is the next level beyond genus and species. To some degree he also includes the order level which is still very messy and commonly being redefined by further genetic studies. Thomas also states that the order level does not often offer enough distinction in regards to identification or ethnobotanical application. Anything beyond the order often differs from botanist to botanist and is still in a rather fluid state. A lot has changed even at the family level especially over the last ten years or so. A number of family schemes have been proposed over the years with Robert Thorne (Thorne, 1976, 1992) and Arthur Cronquist (Cronquist, 1981, 1988) leading the charge in the modern age. Eventually the work of singular individuals and their students, mostly classifying plants based on physical form, gave way to a worldwide network of people organizing by physical form as well as biochemical and genetic characteristics. The work of the Angiosperm Phylogeny Group (APG) split up and at times fused together various family treatments from former authors in (2003), 2009 (Chase & Reveal, 2009; Group, 2009) and most recently last year (The Angiosperm Phylogeny Group, 2016). A number of reasons precipitated these changes. Historically plants were grouped together that looked similar especially regarding flowers and fruits. However, just because one plant taxa looks the same as another one does not mean that they came from the same exact ancestor. This could be because they had slightly different ancestors or through the process of convergent evolution whereupon outside forces such as pollinators or ecotypes drove them to take on similar forms. The goal of classification now is to make what’s called a monophyletic tree whereupon everything is classified in a step wise progression one evolutionary adaptation at a time from one single lineage. Thomas does a good job of explaining that in the 6th ed on page 4. The big point is that many older references will group plants according to the work of Cronquist, Thorne and others. Many of the most recent edition college level botanical texts are still working off of APG II (Castner, 2004; Mabberley, 2008; Simpson, 2010; Spears, 2006). i imagine the newest edition of Biology of Plants takes into account the changes from APG III and similarly with Plant Systematics a Phylogenetic Approach. However, these books cost around $90 each even used so i have yet to add them to my collection (Evert, Eichhorn, & Raven, 2012; Judd, Campbell, Kellog, Stevens, & Donoghue, 2015). Botany in a Day 6th ed. is the best of these book references that i am aware of that takes into account APG III and presents the information in a scientifically accurate yet very approachable and affordable way for the lay public. Wikipedia does do a decent job of this online as well. The website the plant list is my go to source for current correct taxonomy for any plant in the world especially in lieu of an APG III updated flora. It is the product of a partnership between many globally focused botanical research institutions led by KEW gardens in London. Hopefully the end game is near for significant changes in how plants are ordered. If you are starting now you are lucky! If you have been studying plants for a while in this way my condolences. You probably have a whole lot of knowledge and references using older classifications and will now potentially need to live in the two worlds of old and new. i feel your pain if that helps but still think it is worthwhile to become updated, especially if you are a botanical educator. Botanical learning is an incremental process. Botanizing just a little bit each day can amaze one in how much knowledge can accrue over time. Ackerfield, J. (2015). Flora of Colorado. (B. Lipscomb, Ed.). Botanical Research Inst of Texas. Chadde, S. W. (2013). Minnesota Flora: An Illustrated Guide to the Vascular Plants of Minnesota. CreateSpace Independent Publishing Platform. Davis, R. J., & Daubenmire, R. F. (2012). Flora Of Idaho. Literary Licensing, LLC. Gleason, H. A., & Cronquist, A. (1991). Manual of vascular plants of northeastern United States and adjacent Canada. Bronx, N.Y., USA: New York Botanical Garden. Haines, A. (2011). New England Wild Flower Society’s Flora Novae Angliae: A Manual for the Identification of Native and Naturalized Higher Vascular Plants of New England. Framingham, MA. : New Haven, CT: Yale University Press. Holmgren, N. H., Holmgren, P. K., & Gleason, H. A. (1998). Illustrated companion to Gleason and Cronquist’s manual: illustrations of the vascular plants of northeastern United States and adjacent Canada. Bronx, N.Y.: New York Botanical Garden. Hulten, E. (1968). Flora of Alaska and Neighboring Territories: A Manual of the Vascular Plants. Stanford, CA: Stanford University Press. Judd, W. S., Campbell, C. S., Kellog, E. A., Stevens, P. F., & Donoghue, M. J. (2015). Plant Systematics: A Phylogenetic Approach (4th ed). Sunderland, MA: Sinauer Associates, Inc.
Kaul, R. B., Sutherland, D., & Rolfsmeier, S. (2012). The Flora of Nebraska (2nd ed). Lincoln, NE: Conservation & Survey Division, School of Natural Resources. Kearney, T. H., Peebles, Robert H.et al. (1964). Arizona Flora (2nd ed). University of California Press, Berkeley. Lesica, P. (2012). Manual of Montana Vascular Plants. Fort Worth, TX: Botanical Research Inst of Texas. Magee, D. W., & Ahles, H. E. (2007). Flora of the Northeast: A Manual of the Vascular Flora of New England and Adjacent New York (2nd ed.). Amherst: University of Massachusetts Press. Pojar, J., & MacKinnon, A. (2004). Plants of the Pacific Northwest Coast (Rev ed). Vancouver: Lone Pine. Reznicek, A. A., Voss, E. G., & Herbarium, U.-M. (2012). Field Manual of Michigan Flora. Ann Arbor: University of Michigan Press/Regional. Rhoads, A. F., & Block, T. A. (2007). The Plants of Pennsylvania: an Illustrated Manual. Philadelphia: University of Pennsylvania Press. Strausbaugh, P. D., & Core, E. L. (1978). Flora of West Virginia (2d ed). Grantsville, WV: Seneca Books. Wagner, W. L., Herbst, D. R., & Sohmer, S. H. (1999). Manual of the Flowering Plants of Hawai’i (Rev Sub edition). Honolulu, HI: University of Hawaii Press. Weakley, A. S., Ludwig, J. C., & Townsend, J. F. (2012). Flora of Virginia. Fort Worth, TX: Botanical Research Inst of Texas. Weber, W. A. (1991). Rocky Mountain Flora (5th Rev ed). Boulder, CO: University Press of Colorado. Weber, W. A., & Wittmann, R. C. (2012a). Colorado Flora: Eastern Slope (4th ed.). University Press of Colorado. Weber, W. A., & Wittmann, R. C. (2012b). Colorado Flora: Western Slope (4th ed.). University Press of Colorado. Wunderlin, R. P., & Hansen, B. F. (2011). Guide to the Vascular Plants of Florida (Third Edition). University Press of Florida.